My two guest lectures on organic chemistry for the NANO 101 class at the University of California San Diego are available on YouTube. Class 1: Electronegativity, bonding, acid-base, resonance. Class 2: Resonance, notation, Lewis acid/base, chirality, solvents. The 2018 AWIS-San Diego Career Conference was a great success! It brought together 100 young women from high schools and community colleges in the San Diego area to learn about careers in STEM. This event would not have been possible without the 80 volunteers, mentors, panelists and organizers. Thank you! Below are some of the panelists from the Career Workshop I organized. Stay tuned to volunteer for the 2019 edition! How to Solve a Mystery Using Science? On Saturday, October 28, the 30th Annual Chem Expo was hosted for the third year in a row by San Diego Miramar College. The beautiful and inspiring campus welcomed hundreds of middle and high school students. More than 20 booths from local scientific companies, non-profit organizations, and universities were set-up to promote this year’s central theme: Chemistry Rocks! The American Chemical Society celebrates National Chemistry Week by organizing the Chem Expo to showcase how chemistry is applied at work and in everyday life by holding hands-on demonstrations. AWIS-SD did not miss this opportunity to share some fun chemistry with the local community. 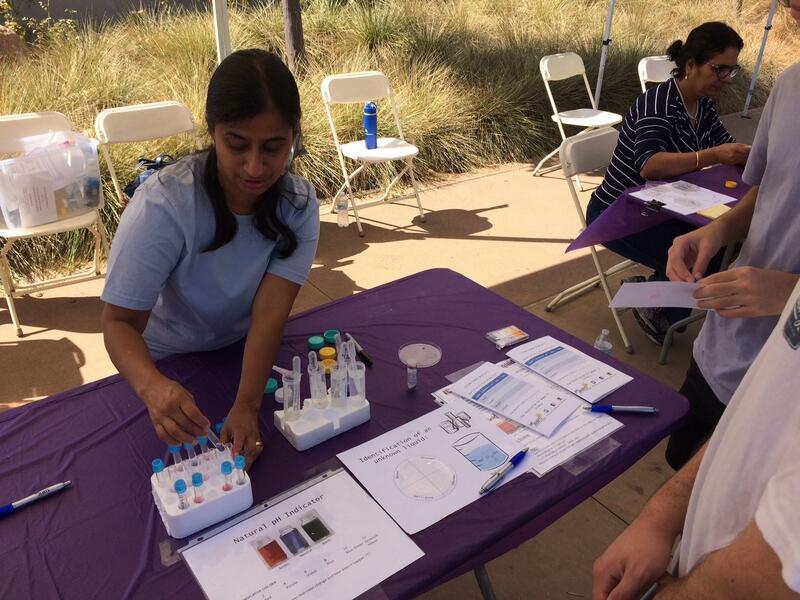 Volunteers at the AWIS-SD booth offered students the opportunity to solve a “crime” using science. Students were given both a mystery liquid and solid that had been left at the “crime scene” with the goal of identifying the mystery compounds. The students performed a series of experiments including the analysis of pH, the determination of starch content using Lugol’s Iodine test, the observation of solubility, and the reactivity of solids in vinegar. Through these basic chemical tests, they scientifically determined the identity of the mystery compounds. AWIS-SD booth at the ChemExpo 2017. The organizers of the AWIS-SD Outreach booth, Anita Pottekat and Laure Kayser, wish to thank the wonderful volunteers, without whom this event would not have been such a success: Melba Nuzen, Kamala Janiyani, Carlos Avila, Isabela Avila, Cyrus Rustomji, Jennifer Ngolab, Sue Lowery, William Strube, Bridget Kohlnhofer, Diane Retallack and all the student and staff volunteers from Miramar College. We also wish to acknowledge the American Chemical Society and Paul Bruinsma for organizing Chem Expo. We are already looking forward to next year’s event!